Century - Our High C Series of fiberglass truck caps was designed to accommodate more supplies and bulky cargo at the request of active truck cap users. Builders, campers, and off-road enthusiasts (to name a few) love their High C's great looks and additional interior height. The High C Series blends style, superior construction and versatility like no other Century model series. High C Series fiberglass truck caps are available for Ford, Dodge, Chevy, GMC, and Toyota trucks. 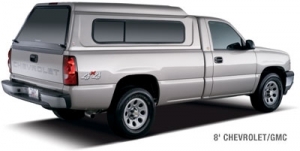 High C Series fiberglass truck caps are available for GMC/Chevy, Ford, Dodge and Toyota trucks. More cargo capacity, same Century styling.